Punching, and press work in general, is a process well suited to mass production. However the initial tooling costs, of both the machine and the job-specific press tool, are high. This limits punch work from being used for much small-volume and prototype work. A turret punch is one way of addressing this cost. The tooling of a turret punch uses a large number of standard punch tools: holes of varying sizes, straight edges, commonly-used notches or mounting holes. By using a large number of strokes, with several different tools in turn, a turret press may make a wide variety of parts without having to first make a specialised press tool for that task. This saves both time and money, allowing rapid prototyping or for low volume production to start without tooling delays. ejected out the back by gravity or air jets. Adjustable-bed or horn presses are used for piercing holes in tubing and in the sides of drawn or formed shells and boxes. Adjustable-bed and gap-frame presses are generally rated at capacities of less than 1.8 MN (200 tonf). Straight-side presses are commonly used for compound-die and progressive-die operations. Increased accuracy, speed, and stability are required for these operations. The turret punch press is a special machine in which the punches and dies are mounted in synchronized indexing tables. 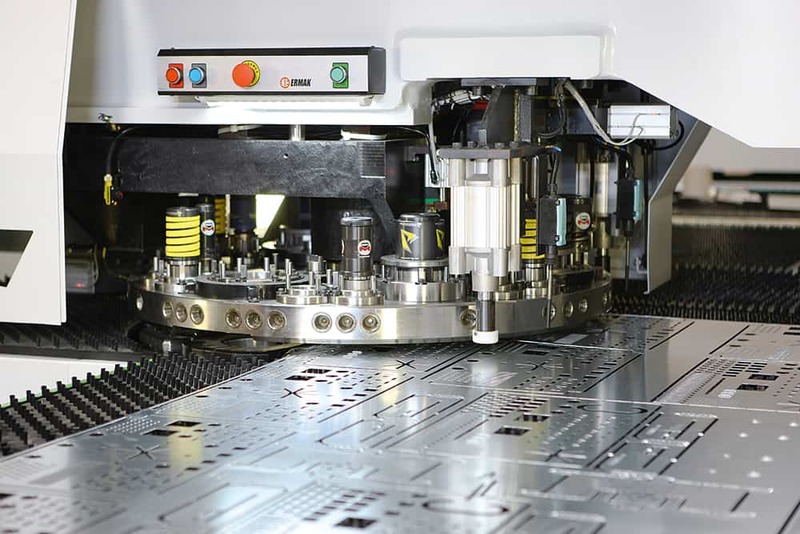 Several sets of punches and dies are mounted in the table, which can be manually or automatically indexed into operating position. A flat blank is pierced and notched in a turret punch press by positioning it under the operating punch and tripping the punching mechanism. The blank is secured to a free-floating table on which a template containing the hole pattern is also attached. Each hole size and shape is coded so that all such holes can be pierced before indexing a new punch and die set under the press ram. The table is moved so that a pin will drop into a hole in the template; this places the blank in the proper position for piercing a hole. After the holes of one size and shape have been pierced, a new punch and die are indexed into operating position, and piercing continues in this manner until the part is finished. Almost any size or shape of hole can be pierced, within the capacity of the machine. A typical CNC turret punch has a choice of up to 60 tools in a “turret” that can be rotated to bring any tool to the punching position. A simple shape (e.g., a square, circle, or hexagon) is cut directly from the sheet. A complex shape can be cut out by making many square or rounded cuts around the perimeter. As a press tool requires a matching punch and die set, there are two corresponding turrets, above and below the bed, for punch and die. These two turrets must rotate in precise synchronisation and with their alignment carefully maintained. Several punches of identical shape may be used in the turret, each one turned to a different angle, as there is usually no feature to rotate the sheet workpiece relative to the tool. an optimization feature that automatically determines the most efficient and most cost effective punching sequence for a specific workpiece. The precise load-out of tools may change according to a particular job’s needs. The CAD stage is also optimised for turret punching: an operation such as rounding a corner may be much quicker with a single chamfered cut than a fully rounded corner requiring several strokes. Changing an unimportant dimension such as the width of a ventilation slot may match an available tool, requiring a single cut, rather than cutting each side separately. CAD support may also manage the selection of tools to be loaded into the turret before starting work. As each tool in a turret press is relatively small, the press requires little power compared to a press manufacturing similar parts with a single press stroke. This allows the tool to be lighter and sometimes cheaper, although this is offset by the increased complexity of the turret and sheet positioning. Turret punches can operate faster per stroke than a heavier tool press, although of course many strokes are required. A turret punch can achieve 600 strokes per minute. The most sophisticated recent machines may also add facilities for forming and bending, as well as punch cutting.Although unlikely to replace a press brake for box making, the ability to form even small lugs may turn a two machine process into a one machine process, reducing materials handling time. A punch is less flexible than a laser for cutting compound shapes, but faster for repetitive shapes (for example, the grille of an air-conditioning unit). Some units combine both laser and punch features in one machine.